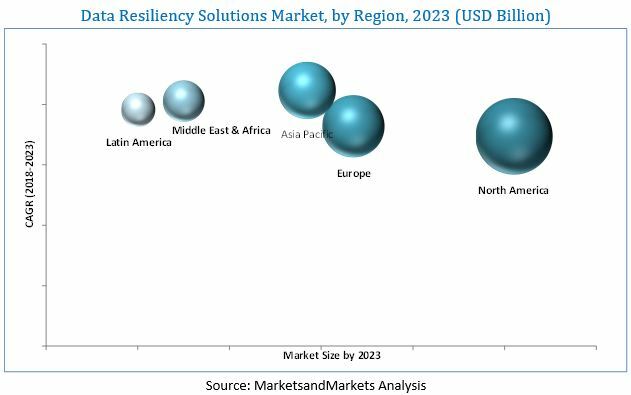 [144 Pages Report] The data resiliency market was valued at USD 10.26 Billion in 2017 and is projected to reach USD 27.63 Billion by 2023, at a CAGR of 18.8% during the forecast period from 2018 to 2023. The base year considered for the study is 2017 and the forecast period is from 2018 to 2023. The research methodology used to estimate and forecast the market size of the data resiliency began with obtaining data from revenues of key vendors through secondary sources such as annual reports, white papers, certified publications, databases such as Factiva and Hoovers, press releases, and investor presentations of vendors of data resiliency solutions, articles from the recognized industry associations, statistics bureaus, and government publishing sources. Vendor offerings were also taken into consideration to determine the market segmentation. 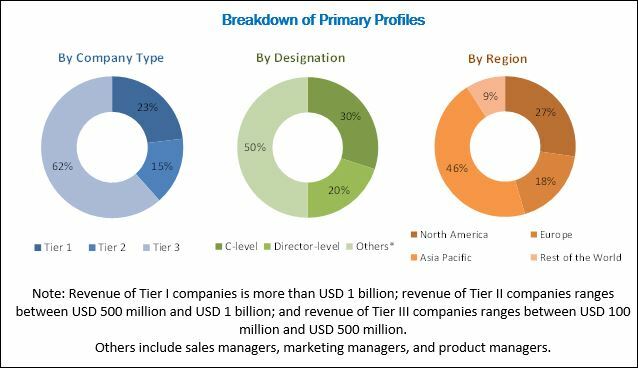 The bottom-up procedure was employed to arrive at the overall size of the data resiliency market from the revenues of the key market players. After arriving at the overall market size of the data resiliency, the total market was split into several segments and subsegments, which were then verified through primary research by conducting extensive interviews with key individuals such as Chief Executive Officers (CEOs), Vice Presidents (VPs), directors, and executives. Data triangulation and market breakdown procedures were employed to complete the overall market engineering process and arrive at the exact statistics for all the segments and subsegments. The ecosystem of the data resiliency market includes key players such as Acronis (Switzerland), Asigra Inc. (Canada), CA Technologies (US), Carbonite, Inc. (US), CenturyLink (US), Commvault Systems, Inc. (US), IBM (US), Micro Focus (UK), Microsoft (US), NetApp (US), Quest Software, Inc. (US), Unitrends (US), Veeam Software (Switzerland), Veritas Technologies LLC (US), and VMware (US). The market size of data resiliency is projected to grow from USD 11.69 Billion in 2018 to USD 27.63 Billion by 2023, at a CAGR of 18.8% from 2018 to 2023. Increasing data generation from various sources, and growing data privacy concerns and the need to ensure data security are the factors driving the growth of the data resiliency market across the globe. The data resiliency market has been segmented based on component, deployment, organization size, vertical, and region. Based on component, the market has been segmented into solutions and services. The solutions segment of the market has been further classified into data backup & recovery, data archiving & e-discovery, and disaster recovery. The services segment of the market has been classified into professional services (implementation & integration services, support & maintenance services, and disaster recovery), and managed services. Based on deployment, the market has been segmented into on-premises and cloud. The data resiliency market has been segmented based on organization size into large enterprises and small & medium enterprises. Based on vertical, the market has been segmented into BFSI, IT & telecommunication, retail & consumer goods, government, public sector, healthcare, media & entertainment, manufacturing, and others (law firms, hospitality, education, transportation, and logistics). The market for data resiliency has been studied in North America, Europe, Asia Pacific, the Middle East & Africa, and Latin America. The disaster recovery solutions component segment of the data resiliency market is projected to grow at the highest CAGR during the forecast period. An effective implementation of disaster recovery leads to the successful recuperation of the data for business continuity. Hence, every organization has started investing either in private cloud disaster recovery solutions or both, private cloud and Disaster Recovery as a Service (DRaaS). Based on organization size, the small & medium enterprises segment of the data resiliency market is projected to grow at a higher CAGR than large enterprises segment during the forecast period. Cost-effectiveness is important for Small & Medium Enterprises (SMEs) as they have limited budgets. Hence, these enterprises face greater resource crunch than large enterprises and as such, require improved methods to resolve complexities for effective cost optimization of their business processes. The implementation of cloud-based data resiliency solutions is expected to result in increased revenues, desired business outcomes, and improved business efficiency for SMEs. The large enterprises segment is projected to lead the market during the forecast period. Based on vertical, the BFSI segment is projected to lead the data resiliency market during the forecast period. The growth of the BFSI segment of the market can be attributed to increased use of data resiliency solutions for ensuring the security of critical data of the BFSI sector. The BFSI segment of the market is also projected to grow at the highest CAGR during the forecast period. The Asia Pacific data resiliency market is projected to grow at the highest CAGR from 2018 to 2023. The growth of the Asia Pacific market can be attributed to the increased use of data resiliency solutions in various verticals such as BFSI, IT & telecommunication, retail & consumer goods, and healthcare to protect and backup their crucial enterprise data. There is also an increase in the adoption of data resiliency solutions in the Asia Pacific region due to rising instances of cyberattacks and ransomware attacks in the region. The easy availability of open-source alternatives for data resiliency solutions is a factor restraining the growth of the data resiliency market as several open-source technology developers have developed effective and cost-competitive data backup and recovery solutions. Key players in the data resiliency market are Acronis (Switzerland), Asigra Inc. (Canada), CA Technologies (US), Carbonite, Inc. (US), CenturyLink (US), Commvault Systems, Inc. (US), IBM (US), Micro Focus (UK), Microsoft (US), NetApp (US), Quest Software, Inc. (US), Unitrends (US), Veeam Software (Switzerland), Veritas Technologies LLC (US), and VMware (US). These companies are adopting different growth strategies such as expansions; agreements, collaborations, and partnerships; acquisitions; and new product launches and product enhancements to increase their market shares in the data resiliency market. *Details on Business Overview, Products/Solutions/Services Offered, Recent Developments, MnM View Might Not Be Captured in Case of Unlisted Companies.